Congratulations to Boston Latin School, recipient of a 2014 U.S. Department of Education (USED) Green Ribbon Schools recognition award. The Green Ribbon Schools program, launched by USED in 2011, honors the highest performing schools for sustainability, health and environmental education in the U.S. This year, Boston Latin School was among 48 schools across the nation to receive the award. Founded in 1635, Boston Latin School (BLS) is the oldest public school in the U.S. BLS serves 2,400 students in grades 7 to 12, the largest school in the Boston Public School district. 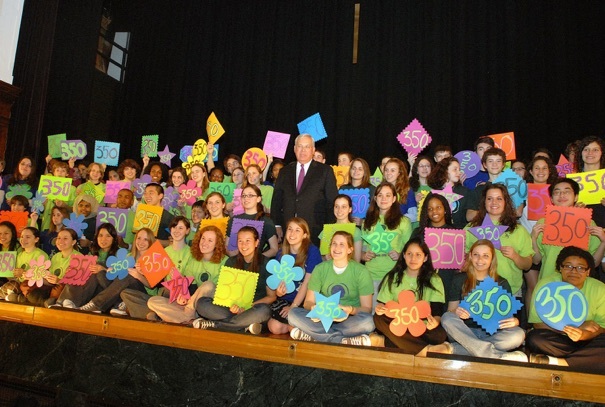 In 2007, BLS students started the Youth Climate Action Network (YouthCAN), an after school club working to implement sustainability initiatives at BLS and in the community. Since then, the club has been featured in several media outlets, including the Boston Globe and the Today Show, and won multiple competitions and awards such as the $75K Global Green School Makeover Competition in 2013 and the EPA Merit Award in 2011. The USED Green Ribbon Schools program focuses on schools’ achievements in three “pillars:” reducing schools’ environmental impact and costs, improving the health and wellness of students and staff, and providing effective environmental and sustainability education through science, technology, engineering and mathematics (STEM), civic skills and green career pathways. BLS has been exemplary in all three. The school achieved a 17 percent reduction of greenhouse gas emissions and 28 percent reduction of water use between 2009 and 2013. Its cafeteria gets fresh produce from an on-site food garden, and chemistry curricula focus heavily on green chemistry to minimize students’ exposures to hazardous compounds. BLS also implemented a senior capstone course that incorporates environmental science themes for environmental literacy. BLS YouthCAN students are working towards an education for sustainability program that involves engaging youths in hands-on learning opportunities. Some previous projects include designing rain catchment systems, fundraising for and implementing a $75,000 energy lighting retrofit that saves 200 megawatt hours of electricity per year, and managing outdoor raised-bed vegetable gardens and a hydroponic vegetable farm for the school. For the past three summers, BLS helped to host and fund a summer Youth Green Jobs Energy Audit training program for students to learn about energy auditing and implement energy action plans at their schools. 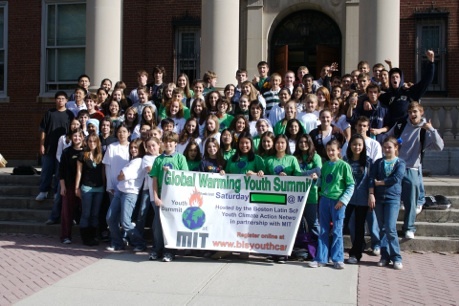 YouthCAN reaches out to other youth organizations, academic institutions, business and public officials in the Greater Boston area, organizing free sustainability events including an annual Climate Summit at MIT. Now, YouthCAN has 30 member groups at schools across Massachusetts. These programs and partnerships have established BLS as a green leader and resource for other schools in sustainability. Currently, YouthCAN is working on their largest and most ambitious project, the Rooftop Sustainability Learning Laboratory, with support from alumni, teachers and the community. For the past four years, YouthCAN students have been engaging and working with local architects and engineers to design a space that holds a rooftop garden and outdoor classrooms, and incorporates technology and curriculum to promote STEM learning. Students envision the project as a state-of-the-art community green roof at BLS that will add some 80,000 sq ft of green space to BLS’s limited urban grounds. Massachusetts participated in the Green Ribbon Schools program for the first time in 2013. BLS joins Acton-Boxborough Public Schools/Acton-Boxborough Regional School District, Berkshire School in Sheffield, Manchester Essex Regional Middle High School and Quincy High School as Green Ribbon Schools in Massachusetts. XiaoZhi Lim prefers to be addressed as X, if you are intimidated by her Singaporean Chinese first name. She is an intern this winter and spring with DOER's Marketing & Stakeholder Engagement group. A former chemist, XiaoZhi is a recent graduate of the Boston University Science Journalism Graduate Program. She enjoys producing multimedia content and stories about energy, environment and electrons.